The Babies on the Bus by Karen Katz (Henry Holt & Co, 2011). Any books featuring "The Wheels on the Bus" is a hit for us because our Toddler Time (the next step up from baby storytime) programs start with that song each week. Karen Katz is a favorite of many of our young readers. They just love those round-headed babies! Baby Beluga by Raffi (Crown Books, 1983). Many Raffi songs have been made into books and parents may remember these songs from their own childhoods. I love sharing books I can sing to add extra appeal to our readaloud. 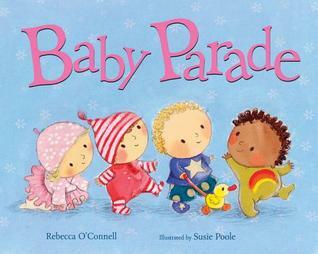 Baby Parade by Rebecca O'Connell (Albert Whitman & Co, 2013). We wave to each baby as he or she passes by, wearing a different color. Brownie & Pearl Step Out by Cynthia Rylant (Beach Lane Books, 2009). This is a very simple, short story about Brownie and Pearl going to a birthday party. Some of my babies have experienced this and it's great to share stories that reflect things they're doing. This is a great simple book if you're looking for a story with a plot to it. Fiesta Babies by Carmen Tafolla (Tricycle Press, 2010). Here's another book about babies! I especially love this one because it includes some Spanish words. This is a great book for reflecting your diverse community and/or for exposing your storytime crowd to different cultures. 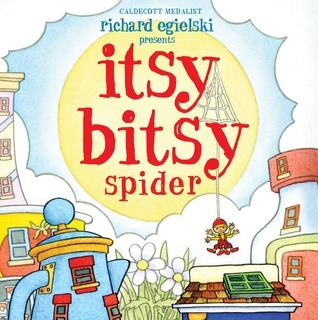 The Itsy Bitsy Spider by Richard Egielski (Atheneum, 2012). We bought this pop-up book for our programming collection. It's a bit of a small trim size, but the pop-ups help generate interest in the book and it's a song that most everyone knows, so parents are happy to sing along. Let's Get Dressed by Caroline Jayne Church (Scholastic, 2012). We talk about many different articles of clothing as we go through this book. I ask parents who's wearing a shirt, pants, shoes, etc. as we get to each part. Nursery rhymes by Annie Kubler. Julie Jurgens of Hi Miss Julie turned me on to the wonderful nursery rhyme books illustrated by Annie Kubler. Each book is short and simple, containing one nursery rhyme. I encourage parents to sing or say the rhyme along with me as we go through the book. Wiggle by Doreen Cronin (Atheneum, 2005). As we wiggle our way through this action book, I ask parents to wiggle each time we hear the word "wiggle", which is a lot! 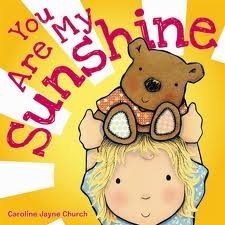 You Are My Sunshine by Jimmie Davis (Cartwheel Books, 2011). I have just fallen in love with Caroline Jayne Church's cute illustrations this year and I've been sharing lots of her board books. This is another one that parents can sing along to and the bright, shiny illustrations will catch the little ones' eyes. Amy Koester of The Show-Me Librarian compiled a list of popular baby storytime books on her blog. What other awesome books do you share with families at your baby storytimes?